I have always loved reading books about Coco Chanel, be it a biography, historical fiction, or straight up without a question pure fiction. She created such an air of sophistication and mystery about herself and has had such a lasting presence in the world of fashion. I recently re-read Coco Chanel & IgorStravinsky by Chris Greenhalgh and it was even better than I remember the first time I read it through. In 1913 a young couturiere Coco Chanel attended the premiere of Igor Stravinsky’s Rite of Spring; it was the birth of a musical revolution that ushered in a new modern era to the musical age. Fast forward seven years later, Coco Chanel invite Stravinsky along with his family, who were exiled from their homeland of Russia, to spend a summer at her villa. Coco Chanel and Igor Stravinsky soon realize that there is a powerful attraction to each other that inevitably cannot be denied. Their whirlwind romance soon turns into a deep love affair, lending them both a burst of creative energy. Chanel brings fourth her own revolutionary creation, Chanel No. 5. Soon their love for each other threatens to overtake important aspects of their lives and could have potential detrimental effects on their live and others. Coco Chanel & Igor Stravinsky is a definite must read and apparently one that is even better read the second time around. I especially recommend this book to those of you who love fashion, Coco Chanel, and the 1920’s. 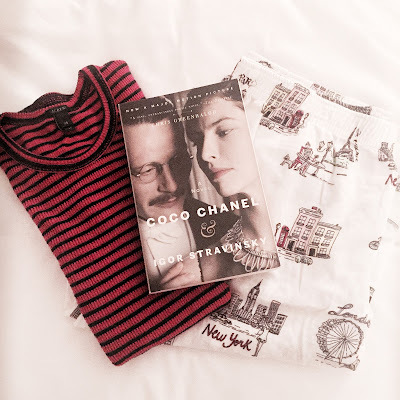 Thanks for this book tip as I love it, too, to read about Coco Chanel! Sounds like such a great read!